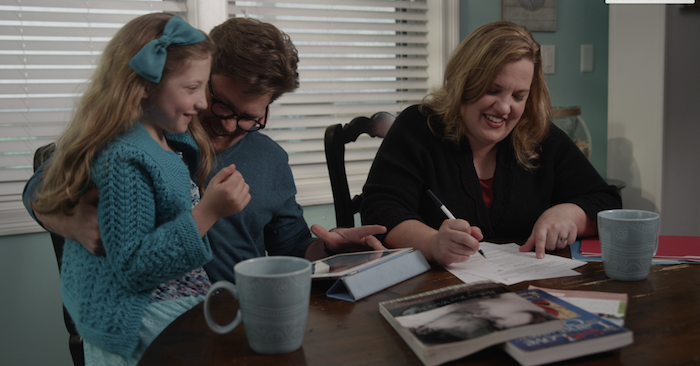 With so much love to give, Amy and her husband decided it only made sense to adopt a child. They knew it wouldn’t be easy, but they were determined to grow their family of three. It took them several years and thousands of dollars to conceive Faith, now eight. Since her daughter’s birth, Amy went through another three years of expensive treatments before she decided they’d need to find another way. Amy and her husband started seriously considering adoption through Bethany Christian Services in early 2014. They soon learned it would cost them five figures to adopt a child. But this didn’t deter them. Instead, they decided to make (and save) some money on the side by decluttering their home and selling their extra stuff on VarageSale. As teachers, this proved quite easy. But all the money they make goes to one place and one place only: the pink envelope. Once home to an anniversary card from her husband, this envelope holds a special place in Amy’s heart. So it would only make sense that she would use it to store the funds for such a special cause. Every last cent Amy makes on VarageSale goes into this envelope. Once it is full, she puts the money into her savings account and starts all over again. And with the help of their community, their fundraising efforts have been a huge success. The couple is already halfway towards their end goal. “People have gone above and beyond the sale price,” Amy explains. One woman bought an antique quilt that was going for $75, but paid $100. Another left $5 for a tote bag that Amy was selling for $2. Every dollar helps, and Amy is touched each time a member pays a little extra. “They’re having a hand in sponsoring … this child,” she smiles. Amy feels blessed that both her family and her VarageSale community have stepped up to help. Her mom and sister continue to give her their unused items to sell, while Amy’s grandma and brothers from both sides of the family have generously donated money towards her adoption fund. 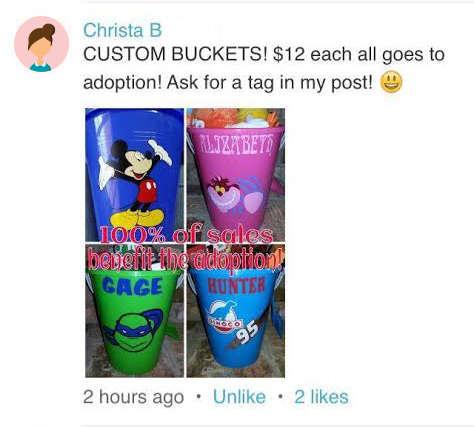 And then there’s the VarageSale member who is customizing children’s beach buckets and donating all proceeds to the fund. Not to mention all the messages of encouragement Amy has received along the way. We couldn’t agree more. Wishing Amy and her family the best of luck as they work towards creating their very own beautiful mosaic! It’s a wonderful win win situation. Wow! I couldn’t agree more! Such an amazing family!